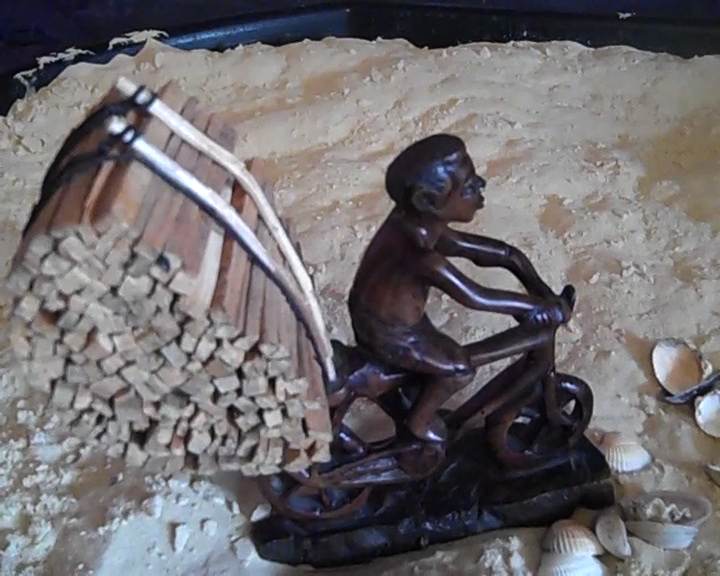 The wooden sculpture sits in a glass display cabinet right by the front door of my house in London. It reminds me of the years I spent living in Malawi. You see, every morning we would eagerly wait for a man to deliver the fire wood we needed to cook breakfast. 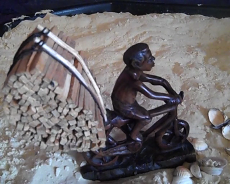 He would appear on a push bike loaded to the brim with branches and off cuts of wood. We were always happy to see him as it meant that breakfast wasn’t going to be far away! 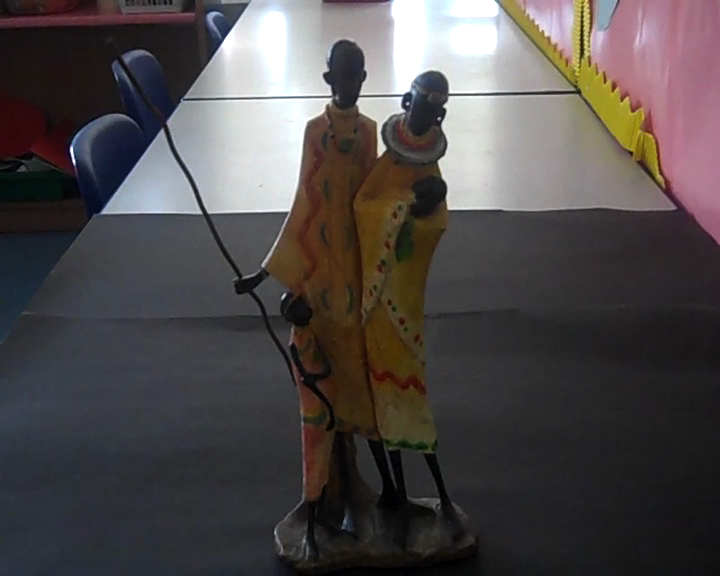 Before moving back to England, I found this statue in a market and I bought it as a reminder of my life in Malawi. I bought a house 5 years ago and my Grandmother came over and gave me a house-warming present. I was then expecting a baby boy and this family of Masai warriors seem to perfectly represent us. It stands on my window sill with the warriors looking out. 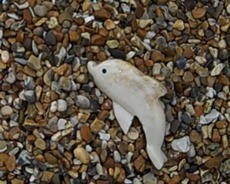 The dolphin is special to me because my children bought it for me on a day trip to Camber Sands. It is made out of marble and sits on a glass shelf in my bathroom. I have had it for at least nine years and it reminds me of some very happy memories on a hot summer’s day. 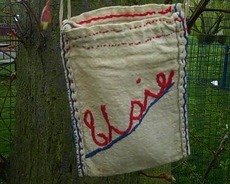 My special object is a small handmade embroidered bag with my mum’s name ‘Elsie’ across the front. She made this bag when she was a small child evacuated to York in WWII. When my daughter, Sam, was in Year 6 at Horn Park Primary doing a topic on WWII, her Nan lent her the bag for the school display. Sam is now 33 and the little bag has been with me since then, twenty two years ago. 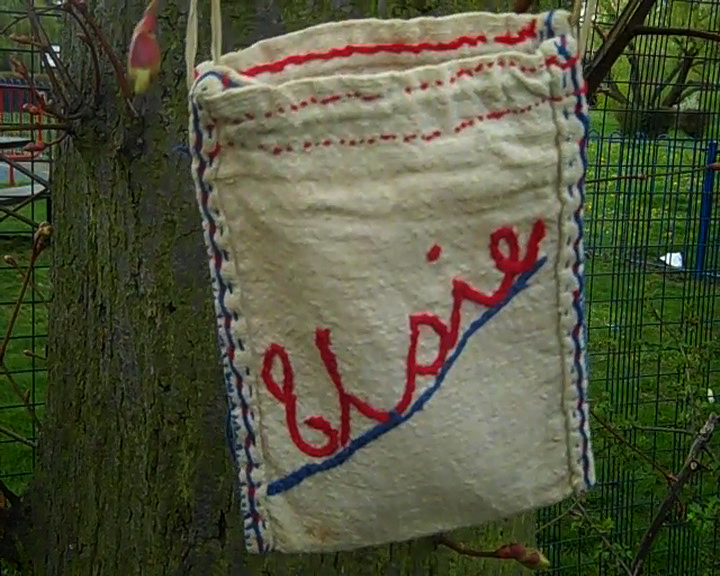 When I bought this little bag in myself for ‘A History of Horn Park in 100 Objects’, inside were still her little explanation labels in her 11 year old writing. More memories! These goggles have been on many summer holidays and seen many underwater adventures. 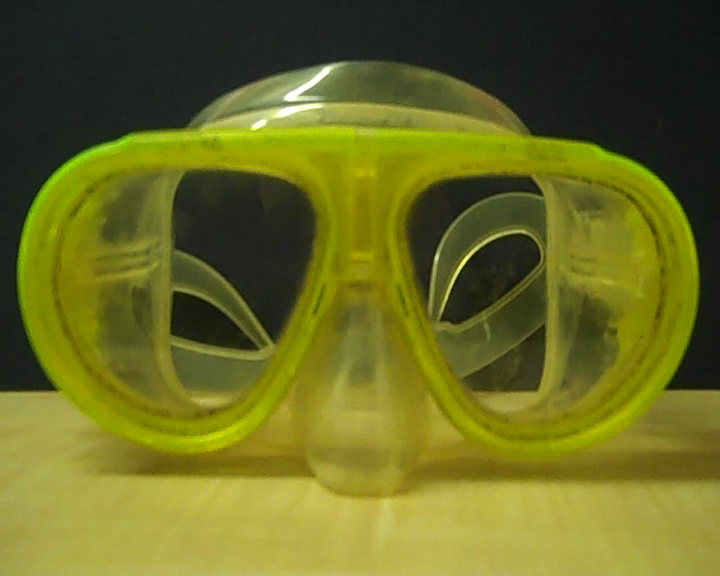 They allow us to see strange sea creatures and imagine subterranean worlds. 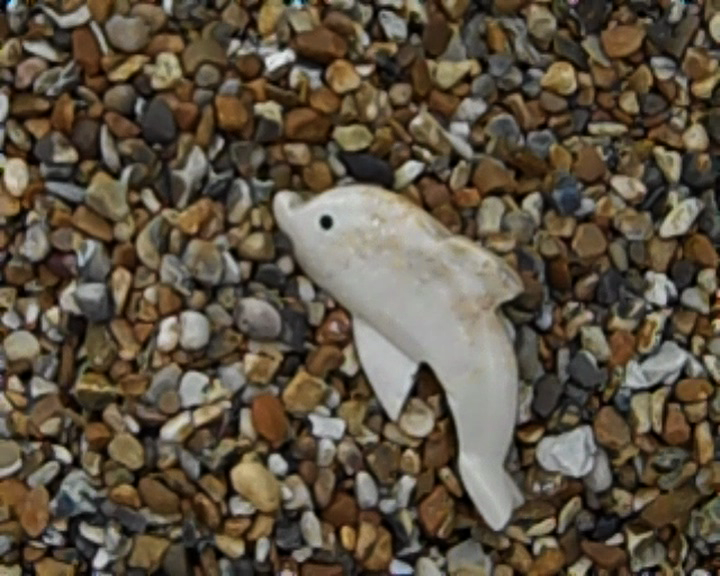 They allow us to open our eyes in salty water. I was given my mobile phone by my aunt on my 40th birthday. I was very pleased because it was an upgrade of my old one! My phone was very special to me because I could take photos of my Grandchildren and Children. When I found out how to use it properly I could even take videos! My phone held my precious memories and I was never without it. 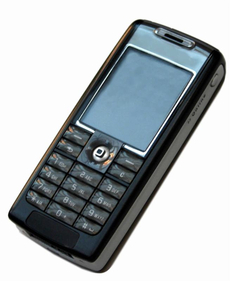 I had many texts from family for birthdays and at Christmas. My phone became my lifeline in many ways. On August 1st 2010 my phone was stolen from me. I am devastated that my precious captured memories are gone forever!! My rabbit is special to me because I have had him for a very long time, since the day I was born – 26 years! My cousin gave it to me at the hospital when she came to meet me for the very first time. 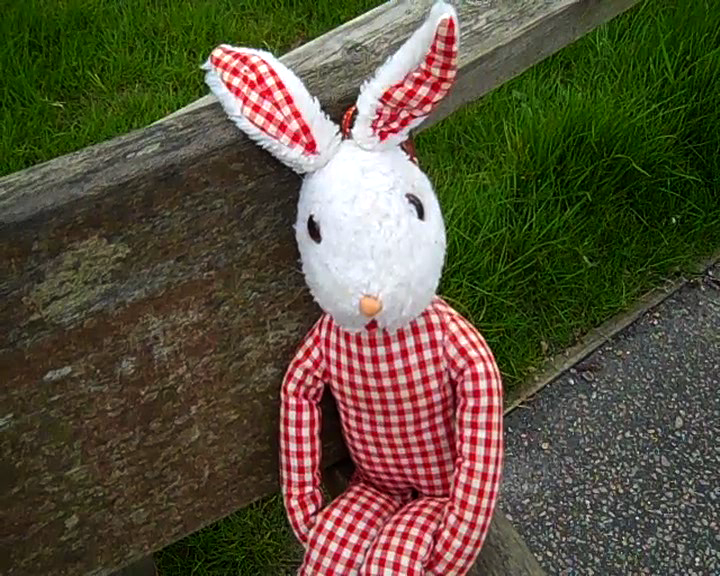 He hasn’t really got a name but has gone on many adventures with me and kept me company on many occasions. He still sits on my bed just like he always has and I still love a cuddle with him now and then. He reminds me of all the fun I had when I was a child and continues all my memories for me. 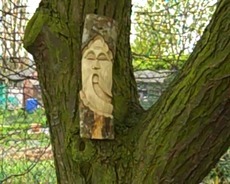 Sometimes it seems like trees have faces. 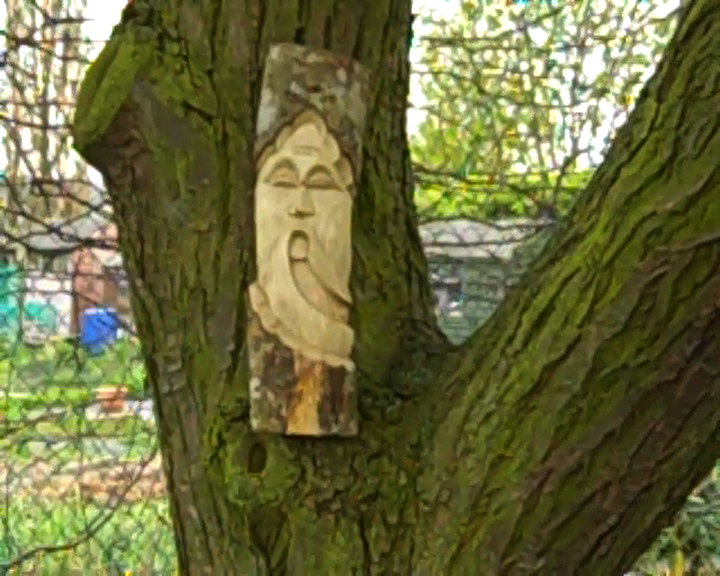 This carved wooden face which belongs to an ex teacher at Horn Park looks like the face of a very wise, old tree in a fairy tale forest. The poem about this object ends with the words Kia Kaha which is Maori for ‘stand strong’.